2019 blank and printable Calendar with South Africa Holidays in Word document format. The calendar downloads are also compatible with Google Docs and Open Office. Ideal for use as a work calendar, church calendar, planner, scheduling reference, etc. All South Africa holiday calendar templates are otherwise blank, macro-free, fully editable and set for printing! All Calendar Word files are in safer docx format. ZA calendars are also available in Excel spreadsheet and PDF format. 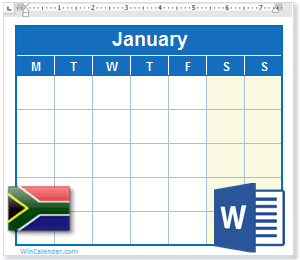 Monthly Calendars with Holidays (South Africa) in MS Word format. For following year calendar with holidays see:2020 Calendar with South Africa Holidays, 2021 Calendar with South Africa Holidays. For prior year calendars see: 2018 Calendar with South Africa Holidays.